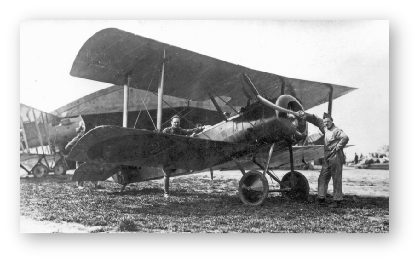 The "Pup" nickname for the Sopwith Scout arose because pilots considered it to be the "pup" of the larger two-seat Sopwith 1½ Strutter. The name never had official status as it was felt to be "undignified," but a precedent was set, and all later Sopwith types apart from the Triplane acquired animal names (Camel, Dolphin, Snipe etc. ), which ended up with the Sopwith firm being said to have created a "flying zoo" during the First World War. The Sopwith Pup entered service with the Royal Flying Corps and the Royal Naval Air Service in the autumn of 1916. With pleasing flying characteristics and good manoeuvrability, the aircraft proved very successful. The Pup was eventually outclassed by newer German fighters, but it was not completely replaced on the Western Front until the end of 1917. Remaining Pups were relegated to Home Defence and training units. The Pup's docile flying characteristics also made it ideal for use in aircraft carrier deck landing and takeoff experiments. The Pup saw extensive use as a trainer. Student pilots completing basic flight training in the Avro 504k often graduated to the Pup as an intermediate trainer. The Pup was also used in Fighting School units for instruction in combat techniques. Many training Pups were in fact reserved by senior officers and instructors as their personal runabouts while a few survived in France as personal or squadron 'hacks' after it was withdrawn from combat.